D.C. Attorney General Karl Racine proposed legislation last week that would make clergy members mandatory reporters of physical and sexual abuse of children. This would add priests, rabbis, imams, and other religious leaders to the list of mandatory reporters which already includes teachers, doctors, social workers, and others who work with children. Similar laws where clergy are explicitly named as mandatory reporters exist in 29 states as well as Guam. This proposal comes in the wake of revelations that the two most recent Archbishops of Washington, Cardinal Donald Wuerl and Rev. Theodore McCarrick, who resigned from the College of Cardinals in July 2018, were involved in either covering up or perpetrating sexual abuse. Wuerl was named in a Pennsylvania Grand Jury report on clerical sexual abuse in the state for his role in protecting priests who had been accused of sexual abuse. 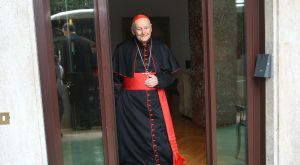 McCarrick was credibly accused of sexual abuse in June 2018 and removed from his role in the clergy. These are not isolated incidents, but are rather part of the ongoing issue of sexual abuse within the Catholic Church. This editorial board supports Racine’s proposal and encourages the D.C. Council and Mayor Muriel Bowser to bring the District in line with other states. This board also feels that while this is a positive development, city and church officials must continue implementing measures to eliminate abuse in all forms. The most recent policy of the Archdiocese of Washington was written in 2013, and requires that all “clergy, religious, seminarian, employee or volunteer” must report physical or sexual abuse, sexual assault, or child neglect to civil authorities. The proposed legislation would put the city on par with the Archdiocese’s standards, but would also add another level of enforcement should the policy go unfollowed. Similarly, Georgetown’s Protection of Minors policy would not be affected, as any individual participating in a university-affiliated program with minors is required to report suspected child abuse or neglect to the university’s office of Compliance and Ethics. Georgetown has taken steps to increase transparency around the impacts recent scandals in the Church have had on our own community. For example, the university has informed the campus community when priests accused of sexual assault spent time at Georgetown. 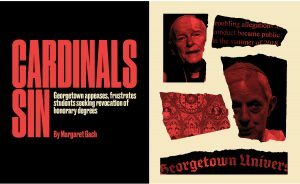 That being said, we cannot ignore the fact that McCarrick and Wuerl still possess honorary degrees from Georgetown. Georgetown’s role as the oldest Catholic university in the country and its home in the nation’s capital gives it the opportunity to lead by example. 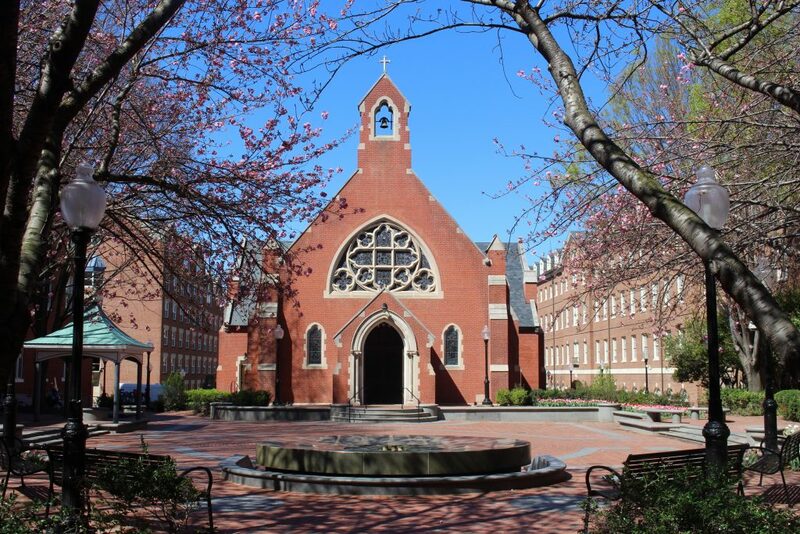 The absolute least that Georgetown can do to stand against sexual assault perpetrated by Catholic clergymen is to revoke these degrees, and demonstrate to its students, faculty, staff, and alumni that Georgetown does not and will not tolerate sexual abuse. But the university should also vocalize its support of Racine’s mandatory reporting proposal. While campus clergy are performing in their roles as priests, any disclosures of sexual misconduct made to them are confidential. However, if a priest not serving in their pastoral role, or any other Campus Ministry staff member, hears such disclosures, they are semi-confidential reporters, meaning that they must relay basic information about the event to the Office of Title IX Compliance, but not identifying information of any of the parties involved. Because some priests also serve as professors, lines may be blurred regarding the implications of confiding in someone when it is unclear what role they are performing. Members of Campus Ministry receive internal training, as well as training from the Offices of Title IX Compliance and the General Counsel every year to prepare them for reporting responsibilities and refresh their knowledge of sexual assault-related resources. This training also provides specific delineations between pastoral and non-pastoral roles. Racine’s proposal is about the reporting of child abuse, and the population of minors who come into contact with the university is small. However, we should encourage people of all ages to feel comfortable confiding in trusted figures about experiences of abuse or assault. Georgetown has an option to report incidents of sexual assault anonymously online. But it’s essential that this confidence is not hindered by a lack of clarity among students regarding the obligations of mandatory reporters under Title IX. And yet, Georgetown does not currently have a full-time Title IX coordinator. Like Georgetown’s current policy, Racine’s proposal provides an exception for information priests learn that would fall under priest-penitent privilege. Any information learned during confession or made in confidence to a minister for a spiritual or religious purpose would be exempt. This is the policy of the Archdiocese, and similar exemptions are provided by 24 of the states which name clergy members as mandatory reporters. While Georgetown has focused on the Catholic Church, other religious institutions are not free from these problems, though. For example, a Georgetown-area Rabbi was convicted of voyeurism in 2015. With these instances in mind, the attorney general’s proposal universalizes the responsibility of religious leaders to protect all members of their congregations. We support this bill as a measure to prevent sexual abuse of children, and we advocate for more tangible and actionable steps in the future to prevent all sexual assault. We acknowledge that this is an issue that expands far beyond the scope of what we have written about here. The issue of sexual abuse perpetrated by clergy ties into the larger systemic problems of gender and power and the hierarchy of men within most major religious organizations. While there is a lot more work that needs to be done to address these issues, this proposed legislation is an important step forward.